As part of the Pacific Pride network, Davenport Energy’s fleet gasoline and diesel fueling is part of a national network for operators who need to fuel and monitor commercial vehicles. 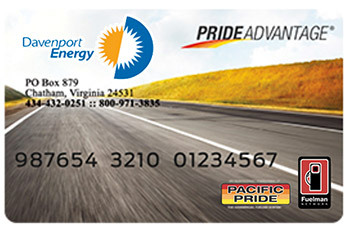 1375 South Boston Road, Danville, Va.
6289 U.S. Highway 29, Blairs, Va.
3007 Riverside Drive, Danville, Va.
As part of a network, your Davenport PrideAdvantage card offers access to 57,000 fueling locations! Fuelman Sites – Accepted at any Fuelman location throughout the U.S.
track vital card and account information, and much more.